I was recently invited to be a speaker at Paris Développement, economic development agency financed by Paris City Hall, and a large number of active members. The conference was organized for foreign companies in France. More than 40 key foreign players came to the event and to listen to the three speakers about Being successful in Paris: Intercultural Management – How to bridge the gap with the French Business Model. The conference was chaired by Mr Christian Sautter, Vice-Mayor of Paris in charge of Employment, Economic Development and International Attractiveness, and President of Paris Développement. My topic was: Working with the French – feedback from the field. The text below is the written and corrected version of the audio recording. The duration of the presentation was 20 minutes. I am a trainer in cross-cultural management. Long time ago I was myself expatriate, twice in Saudi Arabia, once in South Korea. So I started to deliver these trainings almost six years ago for French companies – and also foreign companies working with the French. First I would like to share with you few stories, four exactly. First one is about my first training session six years ago. It was about Spain. I was training a French team because they had a new manager from Spain, who had arrived in France two weeks before. All were based in Toulouse, South West of France. And so, when you, as foreigners, give us some positive feedback or a compliment, we are waiting for the criticisms hidden behind. And one of the mistakes of this Spanish manager was to provide this positive feedback too quickly, after only one week. He should have waited a much longer time. Otherwise we distrust this positive feedback. This was quite interesting experience because I noticed that we the French are not quick at expressing positive feelings to others, but much quicker at expressing the negative. The other cultures do exactly the contrary: they express much more the positive, and much less the negative. This is quite challenging when we have to work together. The second one is a personal feedback from many training sessions. During these sessions within companies, I give some exercises, and sometimes the same exercises with foreigners or French. For example, I give an exercise to British in UK or Koreans in South Korea. I noticed that they take the exercise, they read the instructions and they start to work. It’s quite a difference from the foreigners: I have to convince the French, I must explain, if I want them to be committed to the exercise. Otherwise they won’t do it. It’s a strange difference, isn’t it? I wanted to share these two stories just to tell you that when we have to work with foreigners, we have to think about our cultural strengths, and also our cultural weaknesses. I should ask myself what are my cultural strength and weaknesses, when I have to work with Indians, with Chinese, with Koreans, with Americans, and so on. It’s not an easy question. The third story is about an US expatriate in France. She is American and she came to France to join an insurance company in Paris. After only one week, she made a mistake with her French colleagues. She asked them: « What is your salary? Did you receive a bonus last year? » And that was over, for the three years of her mission in France: there was a lack of cooperation with her. Why? Because asking about money and salary with French is a taboo, a huge mistake. This Korean HR director is importing some typical Korean management practices in France, and it’s not working. So this is the second lesson from these stories. You, as foreigners, as Indian, Chinese, Dutch and so on, you should ask yourselves what are your cultural strengths, and also your cultural weaknesses when you work with the French. When you work with the French, you need to understand the French mentality. And it’s exactly the same challenge as understanding the Chinese or the Saudis. I advise you to understand very well the education system of the country concerned. This will give you information about the mentality of the people which has an influence on the management culture. to say ‘no’ when I mean ‘no’ (whereas most of cultures in the world they don’t say ‘no’: even if they think ‘no’, they say ‘yes’). There is a positive side of this education. I could develop, autonomy, creativity, critical thinking. But there is also a negative side: poor team spirit, taste for personal power, tendency to feel superior, difficulty to be and to feel subordinate when I have a manager. …but only 18% of US managers. …and only 19 % of American employees. Sometimes, when there is a US manager in France, we may find him rude, aggressive, too direct because there is a lack of sociability when we start the work in the morning. But in fact, he is not rude, just… American. And so the French will judge him and it will be the start of the misunderstandings and problems of cooperation. …and 4% of German employees. but only 26% of French employees. The consequence may be a conflict between French and foreigners. From a French point of view, we expect first autonomy then team spirit, and the contrary in many countries: first team spirit, then autonomy, which can lead to some misunderstandings. …and 59% of French managers. So what is a good manager? A leader? An expert? You have to ask yourselves, this is an important question. …and 57% of French employees. If you give an instruction to French, don’t forget to explain also at the same time why you give this instruction. If you don’t, you will have a lack of cooperation from the French. It takes more time, it’s sometimes exhausting, give some context and try to convince the French. Give some explanation because what you enjoy is to have a relationship between two intelligences, two ways of reasoning – but not between a superior and a subordinate. 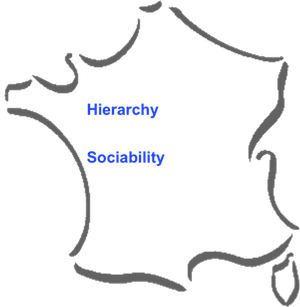 This pair of notions: hierarchy/sociability is similar in many countries: for example, countries in South Europe, South America, North Africa, Asia, and so on. That’s why we can work very well together. 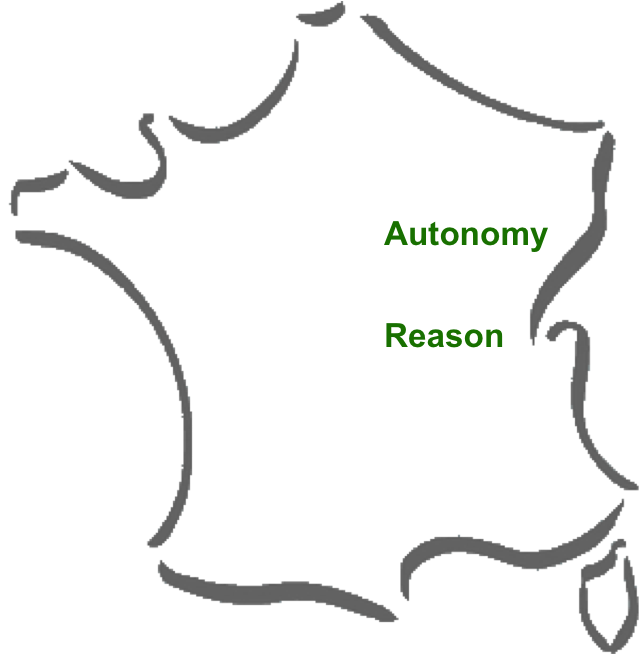 But there is another pair of notions in French management culture: autonomy/reason. These values match very well with cultures in North Europe, Germany, North America. The conflict starts in fact when we mix these two pairs of notions. 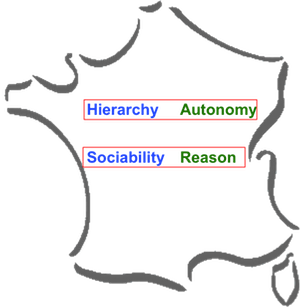 There is a kind of contradiction between a high level of hierarchy and the need for autonomy, between the importance of sociability and reasoning: the French may be very warm and very cold at the same time. The problem increases when the French working with foreigners want to maintain all these values altogether, whereas each pair of values matches very well some cultures. But also – and it is very positive – we have an intellectual flexibility and we may be culturally more flexible than some other cultures where you find only one pair of notions. At any rate, the French mentality is full of contradictions. I would like to share with you a final quote from a book of Philippe d’Iribarne, a French expert of cross-cultural studies. The book is called « The French strangeness » (right, click to enlarge). 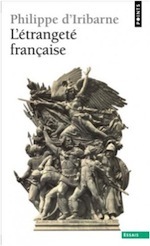 Philippe d’Iribarne studies French society and he writes that France is experiencing a constant contradiction “between the desire for greatness and the ideal of equality”. This contradiction is found in French society – and also in French management. Thank you for your kind attention. Any project of cross-cultural training? Need of information about lectures and conferences? Please use the contact form. You can also follow me with my Twitter account or join my Linkedin group « Gestion des Risques Interculturels » (2000+ members, discussions mostly in French, sometimes in English). Cet article a été écrit le lundi 3 mars 2014 à 23:28	et est classé dans Analyses, Europe, Expatriation, France, Gestion des risques, Management interculturel, Pays. Vous pouvez suivre toutes les réactions par le flux RSS 2.0.
as a French who’s lived in the UK, US and Canada, and worked quite a bit with Asia, I found your talk really insightful, or as an American would typically say, « SPOT ON »! My kids have been through US, UK and French education, and you’re absolutely right, education is the lens through which one can understand attitudes. Merci Michel! Glad to know this was meaningful!… Au plaisir. Thank you for transferring this speech to a post Benjamin. I thoroughly enjoyed reading your insights. Very disheartening and sad to say the least when compared to places like even Turkey who are ready to try something after a one hour meeting. I absolutely agree with you that understanding the country’s education system is key. Once somebody explained Descartes to me (yeah, as an American I had to first find out who he was! ), it all began to make sense. The question is, when will we in France change the education system so that future leaders are more open minded, risk takers, and positive? C’est un exercice toujours délicat que celui consiste à pointer des traits de caractère et les spécificités sans pour autant tomber dans le jugement ou la justification, deux écueils qui rendent en général insupportables les fils de commentaires. En tant que Français -mais peut-être à ce titre étais-je de parti pris ! 😉 -, j’ai trouvé la lecture de votre article tout à fait intéressante, en ce qu’elle donne des clefs pour expliquer et débattre dans une optique constructive. @Jérôme – Merci pour ce retour de lecture. En effet, le but était dans un temps très limité d’inciter à la réflexion sans porter de jugement de valeur. C’est l’enjeu majeur des formations interculturelles avec pour étape suivante la recherche d’ajustements. Having worked in the US, Lebanon, France & recently Singapore, I couldn’t agree more; you simply shed the light on too many crucial elements by providing significant statistical observations. Thank you for this astute article & I hope you don’t mind me sharing it on LinkedIn. Please share, don’t hesitate! This article is published to give to foreigners some cultural keys in order to understand better their French partners. I shared it with my own Linkedin group called Gestion des risques interculturels (more than 2200 members). Actually ‘spot on’ is a British saying, not an American one. Ironic considering what this webpage is about. Thank you for this interesting information. US citizen working for French company in the USA with lots of dependencies on decisions from France HQ. This article offers some helpful insights. Thank you.